The first such event took place in 1964, with 12 stages and 72 Cuban athletes. By the fourth event, foreigners were also participating. Our first Cuban champion was Sergio Martínez (Pipián), also known as the King of the Cuban Highways. Vuelta Ciclista a Cuba is part of the UCI America Tour, which is one of six UCI Continental Circuits sponsored by the Union Cycliste Internationale, the sport’s international governing body. The latest edition of the full event was held in 2011, the 35th in total since 1964. Of the 35 races, 28 have been won by Cubans and 7 by foreigners. Henry Kowalsky, from Poland, was the first foreigner to win in 1967 and Svein Tuft, from Canada, the latest one in 2007. Some of the outstanding individuals on these tours de Cuba have been Eduardo Alonso, Sergio Martínez and, most recently, Pedro Pablo Pérez and Arnold el chiqui Alcolea, winner of the last two editions and currently the star of Cuban cross-country cycling. Since 2011, due to economic pressure, no full Vuelta a Cuba has been held although there remain four more limited national circuits, which keep the tradition alive and serve as preparation for Cuban cyclists. Highlights include the mountainous areas around Baracoa that holds the summits at the border of Imías and the Alto de Cotilla. The race also included traversing the well known, beautiful and challenging Loma de la Farola. Sprints are held at at kilometre 70 at Imías, kilometre 90 at San Antonio del Sur and kilometre 110 at Tortuguilla. 2014 marks the 50th Anniversary of the Vuelta a Cuba and in recognition of this there will be an 8 stage race held from Camagüey to Havana (8 stages) from February 15th to 22nd, 2014. The first leg of the event was 153 kilometers running from Baracoa to Guantanamo to include the mountainous regions of Vivero and Alto de Cotilla. There were sprints in Imias, San Antonio del Sur and Yateritas. Cuba’s main squad was led by Raul Granjel and Arnold Alcolea who were runners up 2008 “Vuelta a Cuba” cycling tour. Cuban Pedro Pablo Perez, who has won the “vuelta a Cuba” on several occasions was absent this year since he is still recovering from injuries he suffered in a car accident last July. Venezuelan Manuel Medina and Colombian Gregorio Ladino returned to ride again in this 2009 cycling event in Cuba. Before the race started, Medina who was the sixth in the Vuelta al Tachira and mountain champion of that tour, said his team mates José Alarcón and Franklin Chacón could win this international cycling event. Early predictions had Cubans Raúl Granjel, Arnold Alcolea and Yasmani Martínez as the best chances of making it to the finish line first. Canadian Keuen Lacambe won the first leg of this year’s Vuelta a Cuba cycling competition which ran between Baracoa and Guantanamo. Lacambe, from the Planet Energy team, crossed the finish line ahead of Alien Garcia of Ciego de Avila and another Cuban, Yasmani Martinez, who led in the under-23 category. The Canadians appeared highly competitive with a squad including Bruno Langlois, a Canadian route champion, and Ryan Roth, runner-up individual time trials in his country. Earlier in the day a persistent light rain baptized the cyclists before the climb to the La Farola viaduct, Manuel “El Gato” Medina (Venezuela) won the first mountain goals of Palma Clara and Alto de Cotilla, without the expected opposition of Colombian Gregorio Ladino (Tecos) who wasn’t among the leaders after winning all the mountain stages at last year’s competition. Back on the flats, the battle centered among the sprinters, with the best being Lizardo Benitez of Guantanamo, who won the intermediate finishes at Imias and San Antonio del Sur. 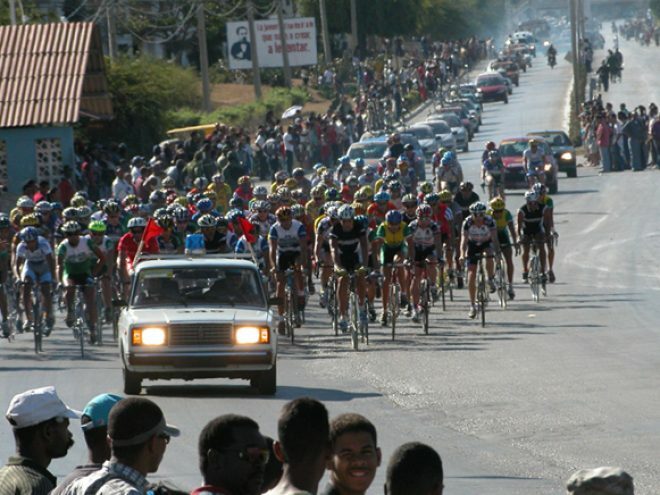 The second leg of the Vuelta a Cuba was a 111-kilometer stretch between Guantanamo and Santiago de Cuba, with intermediate finish lines at La Maya, Songo and the July 26 School City. He neither lost his calm nor jumped with joy. He went on to the podium and shyly smiled while holding the trophy in his hands. Arnold Alcolea attended the awards ceremony as the new Vuelta a Cuba champion with the same modesty that has characterized his career. His reaction might have come from it being hard to assimilate he had become the 18th winner of the Vuelta a Cuba despite winning only one of the event’s stages and not having a particularly spectacular finish. Alcolea carved his win in a different way than past leaders, making consistency his greatest asset, although Canadian Keven Lacombe was finally the winner of the Consistency Award. Alcolea was the second cyclist from Santiago de Cuba to win the General Individual category using his stubbornness. His two most important moments were the win at the Moron stage and the fabulous showing at Topes de Collantes. He proved to be the only leader in the last nine years to win by almost two minutes over his closest rival. No other competitor was capable of disputing the title, because they all emphasized their specialties, but didn’t have the integral virtuosity of Alcolea. It happened to Gato Medina, who was unable to win in Topes despite taking the Mountain Title, and to Parisien, who was unable to safeguard the dividends from the excellent showing against the clock. And so the final results were pretty much determined by the halfway point. From there on the Cuban squad played its role as the leaders fighting to win the team competition while Lacombe and the cyclists from the Cuban provinces took turns at the podium at the different intermediate finish lines. Noslen Funes of Cienfuegos repeated his win of the last stage in 2008 with a 3:12:47 time.